3-D Printing A Masterwork For Your Living Room : All Tech Considered It's now possible to create an impressive copy of Michelangelo's David or Rodin's The Thinker with a 3-D printer. Rather than object, some museum curators see this high-tech replication as a way to bring near-real versions of classic works to the masses. Cosmo Wenman generated this 3-D model of the Ares Borghese, based on hundreds of photos, from the Basel Sculpture Hall. 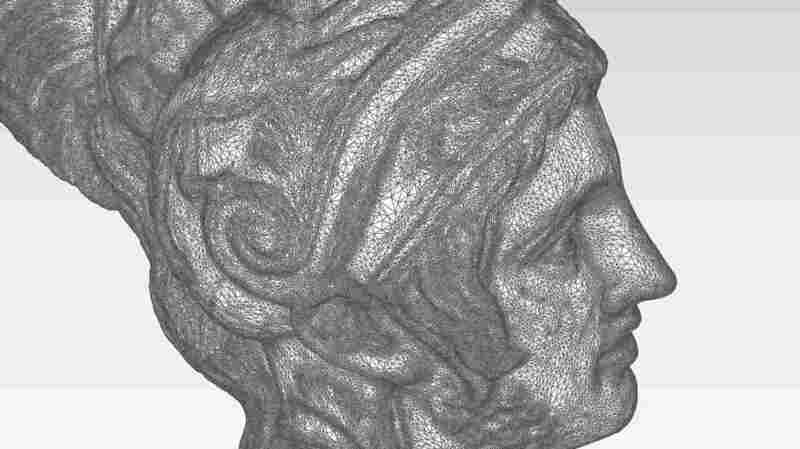 Wenman publishes the scans online, so that anyone can use them to 3-D print a replica of the masterpiece. You may never be able to get to Italy to see Michelangelo's David — but advances in 3-D printing technology are making it possible for you to create an almost perfect replica. It's an idea that Cosmo Wenman is hoping will catch on. He's pushing the edges of how 3-D printing can be used to make classic works accessible. I followed Wenman on an excursion to the Cantor Center for Visual Arts at Stanford University. These days, a lot of museums let people take photos of art, and Wenman takes a lot of them. "It gets a little exhausting and monotonous after the 500th photo," he says. The Cantor has a large collection of Rodin's, and Wenman is photographing Bellona, a bronze bust of the Roman goddess of war. Wenman needs a lot of photos because he wants to create what's called a 3-D scan, and that requires getting all the detail. Bellona has an engraved helmet with flaps that fall along the back of her neck like a horse's mane. She looks down her shoulder with an intense gaze, her taught neck muscles protruding. Wenman has been making 3-D replicas of classic sculptures from museum collections around the world — including the Louvre, the British Museum and the Getty Villa. "I'm trying to demonstrate what the regular consumer can do with consumer-grade photography and consumer-grade software, and even consumer-grade 3-D printers to re-create artwork," he says. After Wenman takes all the photos he needs, he will then process them with some free software from Autodesk and a $2,200 MakerBot 3-D printer. The software is able to bring together all of his photos and re-create an object with three dimensions. Wenman recently started a partnership with Autodesk. After his visit to the Cantor he heads over to the company's office in San Francisco to do some 3-D printing. He stands by the printer and explains how it works. "It's basically a hot glue gun attached to a printing armature," he says. "Instead of a printer just going back and forth spraying ink, this goes back and up and down." The hot glue he's talking about is a type of biodegradable plastic that's good for printing large things — the printer builds up the object with the plastic, layer by layer, based on the software instructions. The result is an object that has all the contours, details and proportions of the sculpture he photographed. As we wait for the Rodin to print, he shows me some small replicas he's made of a classic Greek torso from the Louvre with lots of rippling muscles. Part of Wenman's process also includes putting patinas on the sculpture to make it look like the original. "And to my eye, this is worthy of display in the home," he says. Wenman puts his art scans on the MakerBot-run website Thingiverse, so that other people can print them out at home or wherever there is a 3-D printer. Wenman sees all kinds of uses for his scans of classical works. "Schools could use these for their instruction," he says. "They could make cheap reproductions in the classroom. Art lovers could use them for study. People could just print them and have them in their homes." These torsos were printed in layers of biodegradable plastic. The original sculptures reside at the Louvre in Paris. Wenman got support from Autodesk after the company's Tatjana Dzambazova saw his work at a 3-D printing conference in London. She says most of the showcases were about 3-D printing iPhone cases and toys. But then she saw Wenman's work. "I saw this gorgeous sculpture of a horse, and I say ... 'Oh, my God, what is this?' It didn't look like a 3-D print." She looked closer and met Wenman. "He was trying to show that you can make art, or that you can save heritage," Dzambazova says. So far, no museums have objected to what Wenman is doing. Still, Wenman says he doesn't ask permission to take his photos. He'd prefer to ask forgiveness. But when Cantor Director Connie Wolf sees him in the gallery, she actually seems excited, because a 3-D print is a lot more like experiencing the real object. "The ability to see a sculpture as if you're walking around it is something so important," she says. "I'm very intrigued by it, but I don't know it." Wolf says she sees great value in what Wenman is trying to do, as long as it's for the right reasons. "You want to be sure that people recognize these are studying tools ... teaching tools, " she says. "These are opportunities to enjoy something that's a replica as opposed to a forgery." Wolf also says 3-D printing could raise copyright problems with contemporary sculpture. But she sees it more like a new version of posters, which have made people more interested in seeing the original artwork. Some museums are starting to show interest in promoting 3-D printing of art. The Metropolitan Museum held a hackathon this summer for digital artists and programmers who wanted to help scan parts of its collection. The Smithsonian, which has some 139 million objects and only 1 percent on display at any time, is also encouraging 3-D printing so that patrons can experience more of its collection. Wenman hopes he's leading the way to a future where 3-D prints of sculptures by greats like Rodin or Michelangelo are as common as posters of a Van Gogh.